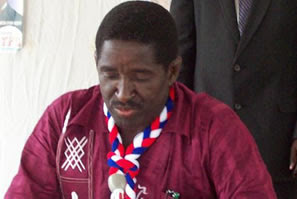 Retired Captain Nkrabeah Effah Darteh, disqualified from contesting the New Patriotic Party’s presidential candidature, is expected to file court processes seeking among other things, to place an injunction on the Congress by close of work Tuesday. Effah Darteh is aggrieved that the vetting committee set up by the NPP disqualified him, and to worsen his plight, his appeal to be reinstated was dismissed by the party’s Executive Committee. Worse yet, he feels bitter that while his appeal was pending before the Executive Committee, the party went ahead to conduct a ballot for the other 17 contestants to plan an outdooring rally recently held at Kasoa. He says he was not even invited to appear before the Executive Committee that sat over his appeal. Sources close to the old soldier say the action of the party presupposes the decision to disqualify him had long been taken and his appeal was therefore an exercise in futility even though he was given assurances that the matter would be reconsidered. Persons close to Nkrabeah told Joy News that even though he was prepared to withdraw from the race, pressure from his supporters to clear his name of the charges levelled against him, has motivated his decision to go to court. Substantially, his suit against his party would dwell on the constitutionality of treason crimes he is supposed to have committed in 1981, and for which the party believes disqualifies him for the post, however, Nkrabeah intends to fight his image redemption battle at every available avenue. To begin with, he would apply to the High Courts, failing which he would proceed to the Court of Appeal and then to the Supreme Court, if need be. And the danger for the party: He would seek an injunction over the congress hoping that he would be reinstated to contest the post.